The SonTek M9 continues to show it's versatility as both an instantaneous discharge measurement device and a bathymetrical survey tool. 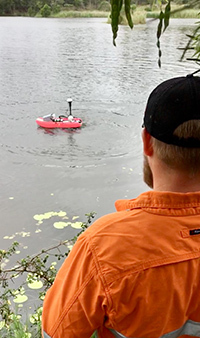 With the integration of true RTK now available and the use of the remote controlled rQPOD, surveying of Storages, River Reach and Open Water bodies is becoming an easy task without need to enter the water. We recently conducted some surveys incorporating all the equipment to test system setup, operating/run time, functionality and software implementation so that we are able to support your queries. Contact us for more information on how the SonTek M9 can solve your surveying and measurement needs.